Prague, 16th October – the 17th international festival of contemporary art 4+4 Days in Motion, which takes place from 26th October to 3rd November, offers many traditional and non-traditional places (an empty building of a former casino, Pařížská street 25, the Archa Theatre, Alta Studio, Alfred ve Dvoře Theatre, NoD, La Fabrika) in nine days full of cultural adrenaline: innovative, progressive and provoking art projects – dance and theatre performances, exhibitions, events in public space, installations, screenings, discussions, street plays, videoart and special concerts. All of them have something in common: they carry the visitors away and present interesting and current things happening in the world and the Czech Republic. The festival hosts many remarkable choreographies, which offer reflection of current issues, relaxation and humour – for instance one of the most impressive recent dance solos (Lisbeth Gruwez, Flanders), a dance and theatre portrait of German terrorist Andreas Baader (Christoph Winkler, Germany), it introduces a performance based on a dialogue of two special “chatboxes” inspired by a TV debate of philosopher Michel Foucault and linguist and activist Noam Chomsky (Annie Dorsen), choreography reconstructing absurdity of a conflict in the Middle East with a detached point of view as well as chilling background (Niv Sheinfeld & Oren Laor), choreography drawing from the analysis of a swimming motion (Justyna Jaslowska), a dance performance of a former member of the Deja Donné company (Virginia Spallarossa), a crazy performance of French performers (Antoine Defoort a Julien Fournet), who use the props – a vacuum cleaner, two camp beds, several tools and football, tennis and volleyball balls – in a very strange way, a unique theatre interpretation of the topic of loneliness balancing on the edge of meditation projects by Petr Nikl and Buster Keaton’s comedies (Diederik Peeters) or a stage adaptation of the last chapter of James Joyce’s Ulysses (Debris Company) – and others. In the Alfred ve dvoře Theatre, you can see a premiere of Super-Natural, a music-like “survival theatre” of a famous group of men Wariot Ideal (Vojta Švejda, Tomáš Procházka, Jan Kalivoda). The V Dlouhé Theatre introduces its project Dlouhá in Motion in the Alta Studio with a cartoon scenic sketch and a puppet drama by Zuza Ferenczová A Problem (Jump Out of Skin). The visitors can see a big exhibition Would you like to play another game? by curators Krištof Kintera and Denisa Václavová, theatre performances (the project called Tremendous Trifles with dramaturge Karel Král with numerous famous companies and artists, Farm in the Cave, VOSTO5 or a Czech premiere of Jiří Adámek situated in an old Jewish flat close to the Casino), events in the public space of the building (a street-art musical project of Hungarian stars HOPPArt, a photo exhibition called Lightboxes or a street event Pokers and Seekers), videoart screenings (from Slovakia as well), lectures on architecture (e.g. architect Stanislav Hubička or a topic How artists play with architecture?, TEDTalks dealing with the issue of urban public space and neighbours’ relationships), walks (e.g. Jiří Sádlo, On Czech Brutalism), street plays (Welcome to Belarus! 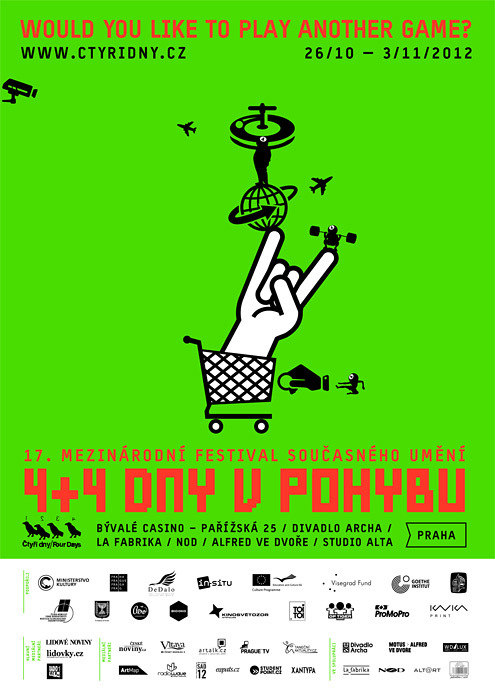 ), symposia (Art(Money)Talk about artists and money or a symposium about Czech and Slovak site specific Non-Galleries), film screenings (Fishhead or Ján Mančuška: The Backwards Play), concerts (The Tchendos, Paapaa, Kyklos Galaktikos). Visitors also have a chance to use an artistic Game Over Bar. A special music project for this space is being prepared by WWW a SPAM (Vladimir 518, David Vrbík) with choreographer Petra Hauerová. A vast installation – environment prepared by the AVU students is a nice surprise as it is inspired by the communist and recent past of the Casino building.